Back to School shopping Marvel Style! Kids I am sorry to tell you but Summer is almost up. Now is the time for the bittersweet time when you have get to shopping ......but for school. The goods news is that hey its not all bad there is some really cool stuff out there for you to brighten up your school day. For the film Spider-Man: Homecoming actor Tom Holland went undercover into an American High School. I am not sure I would want to go back to school. I for one am pretty happy to be done with all of that. That said if I was going to go back to school I would totally be rocking this Marvel stuff. If you are young and facing the school predicatment here is some cool stuff I found. I tried to find products for all ages. Sorry kids we can't help you climb the rope in gym class. Draw on their faces!!! Alright you likely won't do that but these Note Books are still a lot of fun. Maybe you don't need ALL Marvel notebooks but having a few sure is fun. Plus just a thought here but a Hulk or Iron Man notebook really seems to get well with Science........just saying. Baby Groot back packs Nuff Said. I had no idea Baby Groot back packs were a thing but there they are. Tend to think Baby Groot backs packs could be popular in PreSchool or in High School. The Guardians back pack and Spider-Man Homecoming bags are also really neat. The real stand out for me is the comic strip back packs. They kind of remind of the original MCU opening real with the comic pages flipping past. I found quite a few kinds of Marvel folders some showed the Classic Characters, some had a darker realistic tone. Avengers, Guardians of the Galaxy and a lot of Spider-Man folders. 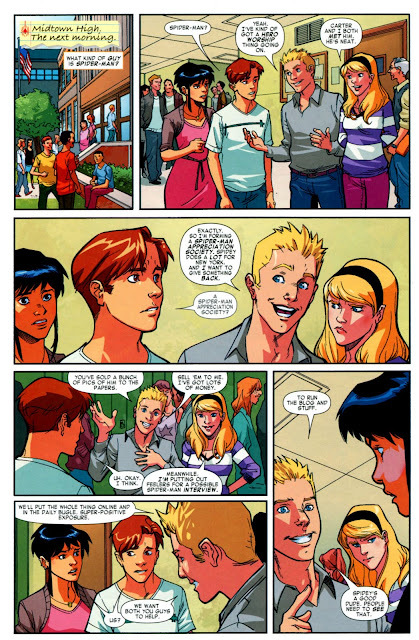 Here are a few fun Back to School Spider-Man Panels! All of you kids take some umbrage in the fact that even superheroes like Peter Parker have to go school. Want to know more about what is going on at Marvel!